When One thinks of Bangalore , the first thing that comes to mind is a Hi-Tech city.But behind this Glamor and Glitz there exists a city full of rich heritage waiting to be explored and cherished. It all strted when I stumbled upon an article of this temple while surfing on the web for Bangalore history. The article was very informative and briefed me on the oldest mention of the word "Bengaluru" which is found in an inscription at this temple of "Begur". Reading the article tickled my inquisitive cells and I decided to explore more on the temple. On a misty Sunday Morning, Me and my friend embarked upon the "exploration" on a bike . After taking the turn for Begur road off Hosur Road, we understood that we are going to have a rough ride ahead. It seems there was a road among potholes and not the other way around. After a lot of maneuvering and inquiring, we finally reached the place. From a distance itself the temple had a look of antiquity. The entrance to the temple was through a small gopuram. 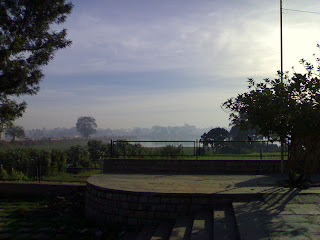 (Which has been replaced by a new one now).The proximity to the Begur lake added to the Charm.The temple basically consists of 5 Shiva lingas, each having its own specialty with its own special meditation spots.. The surroundings gave us a soothing feeling of serenity and warmth.Fortunately we reached at the time when Aarthi (Showing of Burning Camphor to the God) was to be performed for all the lingas. After the Aarthi got over , we inquired about the temple past.The priest (the 15th Generation of the Priest Family of Temple) informed us about the temple . It is believed to be more than 1000 years old and received the patronage of Gangas , Cholas and all the dynasties that followed. The environment encompassing the temple is of peace and serenity. One really feels calm and cool just by visiting the place esp. in the early mornings. Far from the crowd and congestion of the city , the temple is a wonderful, peaceful and serene place to visit . There are few places where you get the feeling of Peaceful Bliss and this is one of those places.The place where you can speak to your inner self and get a kind of unexplainable comfort. Do visit this place when you can get time. Maha Shivratri : celebrated every year on the 13th night/14th day in the Krishna Paksha (waning moon) of the month of Maagha (as per Shalivahana) or Phalguna (as per Vikrama) in the Hindu Calendar (that is, the night before and day of the new moon). Pradosham : Occurs once in every 15 days and considered most auspicious by Shaivites, almost 2 days before either Amavasya (black moonday) or Pournima (full moon day). Update:During my second visit to the temple I learnt from the priest that there are two other temples of the same antiquity and style at Nandi Hills. 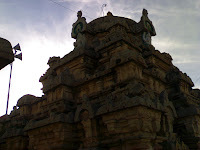 i.e.Bhoganandeeswara temple and Yoganandeeswara Temple. I have not personally visited these temple at Nandi Hills but will like to do the same in near future. I would appreciate if anyone can share more detailed info and experience on these temples at Nandi Hills. Good effort to depict a different angle of bangalore which seldom any one can observe because of the hi-tech impression on the city. Good one Swami..Explore more about ancient Bengalooru let people like me to know more about 'Namma Bengalooru'. Now some renovations going on this Temple.. Nice to know this ancient temple is being preserved. 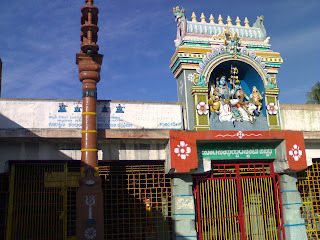 Now the connectivity to this temple also much better from Hosur road and Bagur Road. The Bagur lake proximity is something which gives an amazing look in the evening..there's lots of lotus flower also..also there is much tourism options as well.. hope temple wil l regain its fame.. Your photo above, Swami, made me thing that it was going to be an extremely large temple. It isn't but it is lovely. Beautifully carved. Thank you for introducing me to it. My Pleasure, Indeed it must have been a very grand temple. If you see the life size Sapthamathrika panel and The famous Begur Stone in Bangalore Museum.. It will give you the scale of grandeur it might have possesed. Lovely writeup. I am always on the lookout for such places of historical interest. what a peaceful temple. historic and almost 1300 yrs old. wonderful. I am a regular visitor to this lovely temple. Hi Swami, Thanks a lot for the information on the Begur temple.. Even I am a travelling freak and I do visit lots of ancient temples. With regard to the temple near Nandi, I have visited couple of times there. Its one of the ancient and beautiful and big temple and the kalyani is owesome..
Really informative post and appreciate the inscription and translation towards the end. Would like to know, where to find the contents of the inscription mentioning "Bengaluru" - there is some talk of a war also I believe.